Cells interact with their environment. They are able to perceive neighbors and respond to external signals that guide their behavior. More often than not, the perceived signals are directional and lead to a cellular response whose polarity is physiologically critical. Examples of such chemotropic behaviors include those of leukocytes migrating towards and responding to antigens, amoebae responding to a cue for aggregation, neurons extending growth cones to form neural networks, pollen tubes growing in the stigma towards the egg cell or fungal hyphae creating connected mycelia. The meeting of gametes during sexual reproduction is a particularly important form of chemotropic behavior, which culminates in their fusion to form the zygote. Fungal cells exhibit a chemotropic response to pheromone gradients expressed by partner cells. During sexual differentiation, cells of distinct mating types (P and M) secrete pheromones recognized by cognate G-protein coupled receptors on the partner cell. This activates a common signaling pathway that involves activation of Ras GTPase and MAP kinase cascade. We are interested in exploring the mechanisms by which cells detect pheromone gradients and re-orient their polarization machinery towards a mating partner. We have shown that, in the early stages of the mating process before cells have selected a mating partner, or upon exposure to low-level pheromone levels, fission yeast cells display a dynamic site of polarization. The small GTPase Cdc42, a central eukaryotic regulator of cell polarization, forms a cortical patch that appears and disappears dynamically at the plasma membrane. Ras GTPase, which promotes Cdc42 activity, is also active at these patches. Interestingly, patch dynamics depends on pheromone concentration, with higher concentrations extending the patch residence time. The timelapse shows cells of distinct mating types, in which activators of Cdc42, which are co-dynamic with Cdc42, have been labelled green or red. The green-labeled cell appear to explore several potential partner before settling on one for fusion. We further discovered that these patches are fully developed polarity sites, at which secretory vesicles (transporting amongst other cargoes the P-factor) accumulate, and which (in M-cells) are enriched in the M-factor transporter, arguing that pheromones are locally released at these sites. Furthermore, while pheromone receptors occupy a large portion of the cell surface, the associated Gα specifically accumulates at the patch, suggesting that the patches are sites of receptor activation, in agreement with pheromone levels modulating their lifetime. Thus, each patch is a mobile communication site, where pheromone signals are sent and locally interpreted. From these observations and complementary modeling work, we proposed that yeast cells forms pair through a “speed-dating” strategy. The cortical communication patch is mobile, but stimulation by pheromone released by a partner zone stabilizes it. This leads to a positive feedback, where the encounter of patches from two partner cells stabilize each other through local pheromone release. Such feedback is also critical in the transition from growth to cell-cell fusion. Bendezú FO, Martin SG. Cdc42 explores the cell periphery for mate selection in fission yeast. Curr Biol. 2013 Jan 7;23(1):42-7. doi: 10.1016/j.cub.2012.10.042. PMID: 23200991. Martin SG. 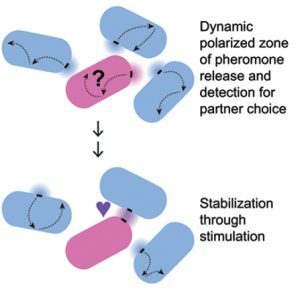 Local Pheromone Release from Dynamic Polarity Sites Underlies Cell-Cell Pairing during Yeast Mating. Curr Biol. 2016 Apr 25;26(8):1117-25. doi: 10.1016/j.cub.2016.02.064. PMID: 27020743. Khalili B, Merlini L, Vincenzetti V, Martin SG, Vavylonis D. Exploration and stabilization of Ras1 mating zone: A mechanism with positive and negative feedbacks. PLoS Comput Biol. 2018 Jul 20;14(7):e1006317. doi: 10.1371/journal.pcbi.1006317. PMID: 30028833.